My son just got stationed in Oak Island, NC. Where are the closest BE matches near Wilmington, NC? Sir Walter? That's 2.5 hours away. Was hoping there is something closer, preferably a .22 league or something. He is a seasoned shooter(3-4 years), but has done mostly .22 only at 50'. He only has one 2700 under his belt. And his wife currently works every other weekend, so he has some free time on his hands. What I'm trying to get him away from is shooting .22 only. He shoots master scores with a .22, but once he starts shooting 2700's, he's going to get a rude awakening. He has shot a few sanctioned sectionals, but fortunately has not been clessified based on those scores. So he is currently unclassified. This is Mike Davis from LPT. I think that there might be something between Sir Walter and the Coast, but I am not sure. There are several ranges North and West of Wilmington that claim 25y and 50y pistol, but have no websites or information on Bullseye. Camp Lejeune doesn't have any pistol matches? If I remember correctly, they held rifle matches that were open to civilians. 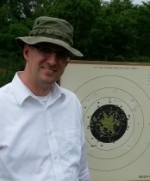 I looked at 3 outdoor and 2 indoor ranges in the Wilmington area. Seems they like IDPA and USPSA. But no bullseye. I'm pretty interest in this...I have a job offer in Wilmington that I am considering accepting. Sir Walter and Orangeburg SC are probably the closest bullseye matches. The Buccaneer range would be a great location someone to get a bullseye program started as I know a number of shooters up and down the coast would be interested. (HINT!) Kart used to have some local non sanctioned matches down towards Ash and Shallotte, you might try expanding search that way. In any event, please come join us at SWGC if you can make it!